Having the right mobility solutions and collaboration tools in place to support a variety of work styles, whilst keeping a tight grip on security – is paramount for success. Organisations that don’t adapt to this changing technological landscape risk losing talent and delivering poor services. Designed to meet the demands of a mobile workforce, our workplace solutions help organisations to give employees the tools and support they need. Whether inside or outside the office, our approach is designed to connect your workforce to three key business assets: information, people and applications to increase productivity and performance. We invest time in understanding the current user experience, your organisation’s future needs and business objectives to deliver bespoke workplace solutions that really work. We have helped numerous customers in both the pubic and private sectors improve productivity, collaboration and mobility within the workplace with our digital enterprise and mobile solutions. Read how the Family Building Society’s intranet – delivered in just 8 weeks – has led to a much more collaborative way of working. Get ready by benchmarking your goals, identify business value, your gaps, build a plan, test & approve. Gain insights through workshops, assessments and proof of concepts to help you get started. Provide best practices and support for your organisation to determine the right policies and framework necessary to build a secure foundation for your Digital Workplace – This includes access rights, device types and networking considerations. We can help migrate and bring your productivity tools – email, calendaring, contacts, online conferencing, sync & share, instant messaging and social media to empower your workforce. Once you are up and running, we can help you maintain your workplace including health checks, support & maintenance and business continuity. Our User Productivity Assessment identifies the benefits of a modern operating environment and the requirements from a technical perspective to ensure that the new operating model is aligned not only to your core operating practices but that it provides value to your organisation, delivers a consistent and positive experience for users, reduces support requirements for your IT teams and lowers your overall operating expense. Following the user productivity assessment, we will deliver a set of recommendations, which will enable you to create your own outline business case, and a plan for the next steps once your business is ready to progress. 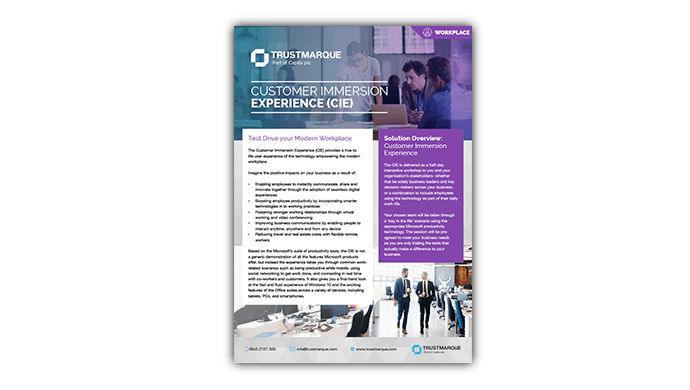 Based on the Microsoft’s suite of productivity tools, the Customer Immersion Experience (CIE) takes you through common work- related scenarios such connecting in real time with co-workers and customers. It lets you use the latest software to show you how using technology can create new ways of working, and explores how to make the most of your staff abilities and enable them, and your business, to be more productive. It lets you experience Windows 10 and the features of the Office suites across a variety of devices, including tablets, PCs, and smartphones. Our Business Productivity Assessment helps to support your business and the demands of your staff. Through a systematic process of business analysis and technology consulting, we can help define the high-level vision for collaboration within your organisation. Helping to create the business case for change and deliver fit for purpose solutions in full alignment with the strategic goals of your business. 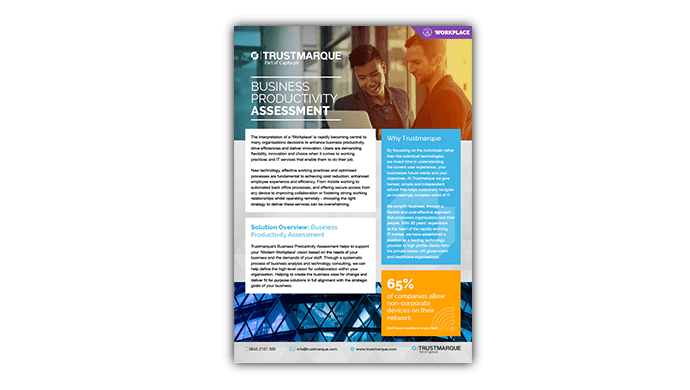 Trustmarque has developed our Windows 10 Upgrade Readiness Assessment to remove the guesswork from the preparation process for Windows 10 deployment. It provides an in-depth understanding of your current desktop environment and application portfolio to ease your transition to Windows 10. Why migrate to SharePoint? Because SharePoint offers significant business benefits for organisations, such as improving collaboration and productivity among the workforce. However, tailoring SharePoint to specific organisational needs, deploying and maintaining organisation-wide can be a challenge. Migrating to a new desktop operating system is a highly complex and potentially costly operation that will affect every user in your organisation. 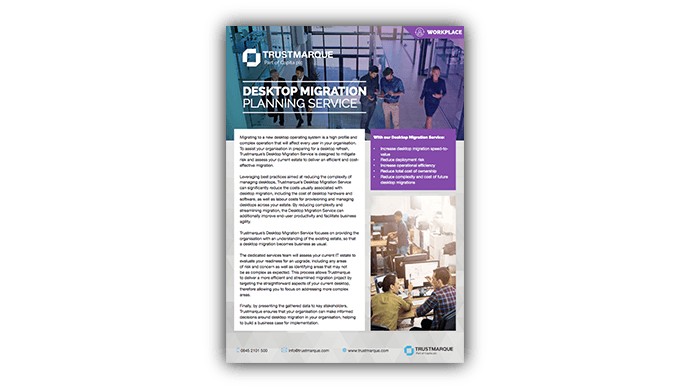 Our Desktop Migration service is designed to mitigate risk and assess your current IT estate to deliver an efficient and cost-effective desktop migration. It covers a range of key technologies including Windows 10, desktop and application virtualisation, Citrix and VMware, application packaging as well as Office 365. 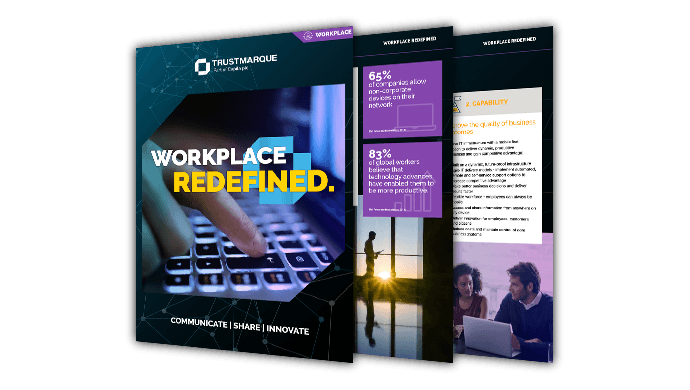 Deploying a modern desktop improves productivity, while providing IT departments with the level of control, manageability and security they require to work efficiently. 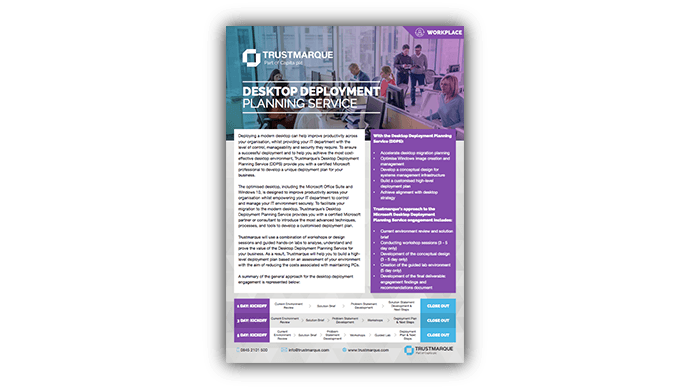 To ensure a successful, cost-effective deployment, Trustmarque’s Desktop Deployment Planning service (DDPS) provides a certified Microsoft professional to develop a unique, robust and bespoke deployment plan. 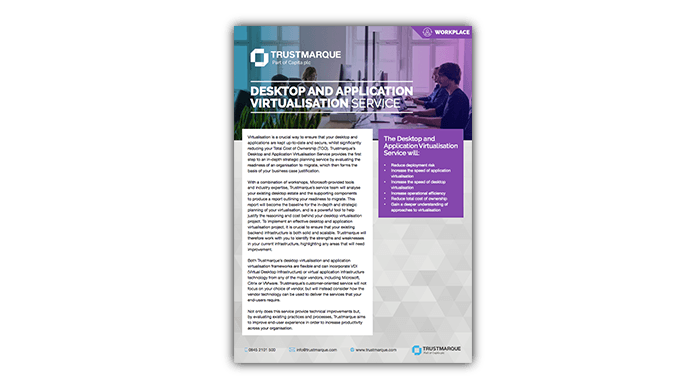 Virtualisation is a crucial way to ensure that your desktop and applications are kept up-to-date and secure, whilst significantly reducing your Total Cost of Ownership (TCO). Our Desktop and Application Virtualisation service evaluates your current desktop and application estate and readiness to migrate. Today’s complex technology marketplace is fundamentally changing business priorities. As a result IT departments are having to react to different scenarios and customer demands, whilst maintaining a commitment to growth, improving business processes and delivering stable service. Our Business change management tools and transformation services help organisations manage these challenges by working collaboratively with teams to develop practical solutions to the challenges of today. In this customer-driven world, the ever-changing needs of today’s customers presents organisations with many challenges. 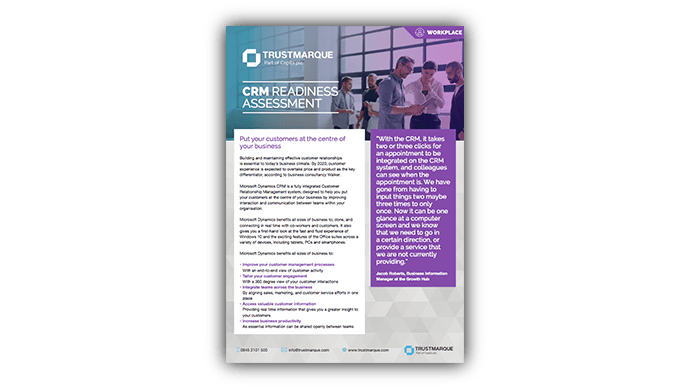 A Customer Relationship Management (CRM) strategy can empower organisations to better manage customer interactions and acquisition processes, form strong relationships and retain customers across multiple channels. Our CRM services offers technical and market expertise, along with the support and service capabilities needed to deliver a CRM system and associated services seamlessly. From a pre-configured arrangement to a bespoke end-to-end solution, our experienced team will help you deliver an effective service. Read how our CRM platform has helped the Skills Funding Agency Data Collections enhance its funds collections process.